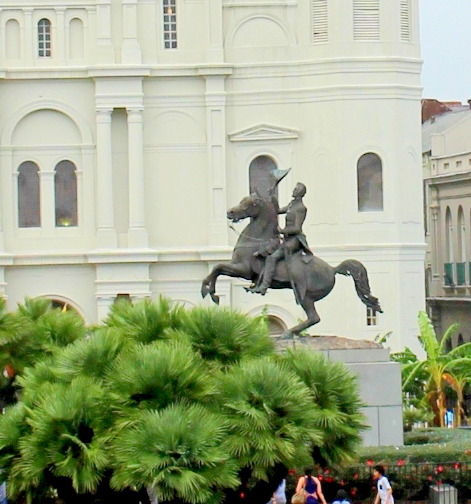 One of the famous landmarks that you don't want to miss when you visit New Orleans is the Jackson Square. Jackson Square formerly known as the "military plaza" is a historic park in the French Quarter of New Orleans, Louisiana. It was declared a National Historic Landmark in 1960, for its central role in the city's history, and as the site where in 1803 Louisiana was made United States territory pursuant to the Louisiana Purchase. In the center of the park stands an equestrian statue of Andrew Jackson erected in 1856. Jackson is the famous hero of the Battle of New Orleans during the War of 1812 who overwhelming defeated a superior British force.